The rainy season has arrived, as well as the annual flood cycle that is currently taking place, especially in areas such as Jakarta. Many places into flood-prone point so that a barrier of access roads. Flooding that occurred a few days ago made a lot of motorcyclists and car experiencing similar problems, namely "strike machine". Not just about the vehicle, but the access to go to work or return back home run into obstacles, such as access roads are cut off due to flooding, the time taken for a long time and yet another vehicle died as a result of stagnant water flood into the engine. This is certainly a difficulty when it occurs in a relatively long time is not it? When floods, exhaust motors fully submerged in a pool of water, it would not be turned back, because water has entered into the gas tank. But it is different if only a little water in, so that the engine while the vehicle is still able to neutralize these conditions. Therefore the first step is to drain the water that has entered into the motor exhaust to dry. The cause of the motor broke down shortly be due to two things, namely, motorcycle carburetor flooding penetration of water so that the water mixes with fuel vehicles that cause the motor broke down and the motor plugs are wet, so that the spark plug that has a function as a cigarette lighter flame when exposed to flood water will strike because of wet. To perform drainage in your carburetor can open sewer gas in your motor, cast the correct amount of gasoline in the carburetor float. Then for motorcycle spark plugs, you can take it off for a while to wipe with a dry cloth to miss the spark plugs and plug parts, so that plugs can return to function properly. Once this is done, you can re-install the spark plug and perform the manual for your motor starter, this step is to warm up the engine. 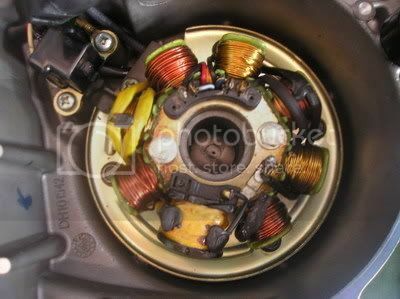 To ensure the condition of your motor really in good shape, a good idea to also check the electrical system on your bike, if there is a short circuit occurs or not. After that to maintain the performance of your motorcycle can also clean your bike dirty from all the dirt and mud attached when the floods hit. In this case, the brake drum and brake pads plays an important role, because when braking suddenly when they want to do you can control your balance or hold the brake to break through the flood when using gear 1. Therefore, you should also clean the two components is to actually clean. However, if the condition of brake pads is up, you should immediately change your motorcycle brake pads with new ones, to keep the performance of your motorcycle to pre-flood.